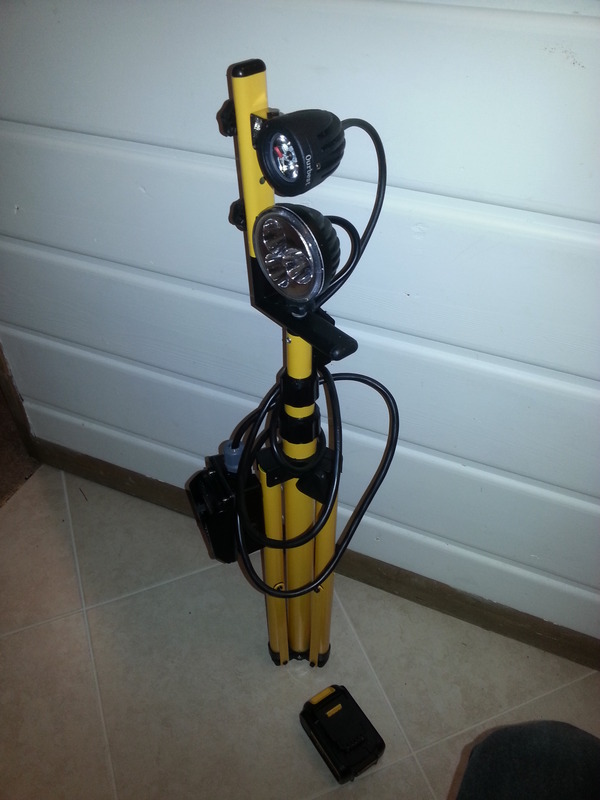 Cordless tripod worklight with spotlights powered by Dewalt 20v battery. 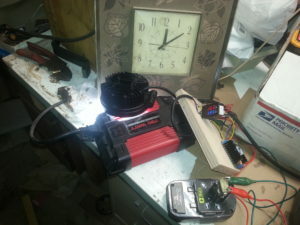 All the cordless power tools today are using lithium battery packs, replacing the old nicad batteries used in the past. I have a variety of brands of cordless tools, including at lot of random junk of course, and I’ve been comparing the design of the different brands of lithium battery packs, so I can adapt batteries across different brands of tools. Charge over-voltage protection Pack Pack Charger Charger Charger Charger? ? Cell balancing In pack In pack In charger None In pack None in older LXT packs; unsure about newer ? Nicad batteries are simple. You just need two wires from the pack to power the tool, run the tool until it got too slow or weak, then recharge the battery. But the batteries were heavy, and voltage (and tool speed and power) drops rather quickly as the charge is depleted. Lithium batteries provide better results in the tools, but need protection circuitry to prevent over-charging (which can start a fire) or over-discharging (which can permanently damage the battery cells). Battery packs with built-in protection circuits inside the pack are easier to retrofit to tools originally designed for nicads. Ryobi and Ridgid have even kept the same battery connection from their older 18 volt nicad tool line into their newer lithium line of tools. Dewalt changed battery connections, but also supplies an adapter (DCA1820) to use the newer XR lithium packs with the older 18v nicad XRP line of tools. Other brands like Makita, Black&Decker, Porter-Cable provide no backwards compatibility. Note that all of the brands advertised as 18v, 20v, or 20v Max, all operate at the same voltage and power. All are made up of 5 lithium cells in series that measure about 20v fully charged, then drop quickly to an average of 18v in use. 20v battery packs and product lines do NOT have more power than 18v packs and product lines; it is just marketing spin. I got a pile of dead or questionable 18-volt power tool lithium battery packs on EBay for $1; just the right price for my hobby budget! They need to be load tested, to determine how much usable capacity they have. Here’s my jig for that. The battery powers a 120-volt inverter, which runs a wall clock. I set the clock to noon (or midnight, whichever you prefer) and connect a fully-charged battery. The voltage drops as the lithium battery pack discharges, and the internal protection circuit cuts out the battery when it gets to 15v, and the clock stops there. That tells me the working time of the battery pack at 32 watts, without needing to watch it the entire time. I just come back later and see how long the clock ran. Et voila! Easy and reasonable capacity measurement. The inverter didn’t like being powered directly by the 18v battery. It was designed to work with 12v automotive power and shuts off if the input power is over 15 volts. So I added a cheap DC-DC converter to step down the battery voltage from 18v to 13v. 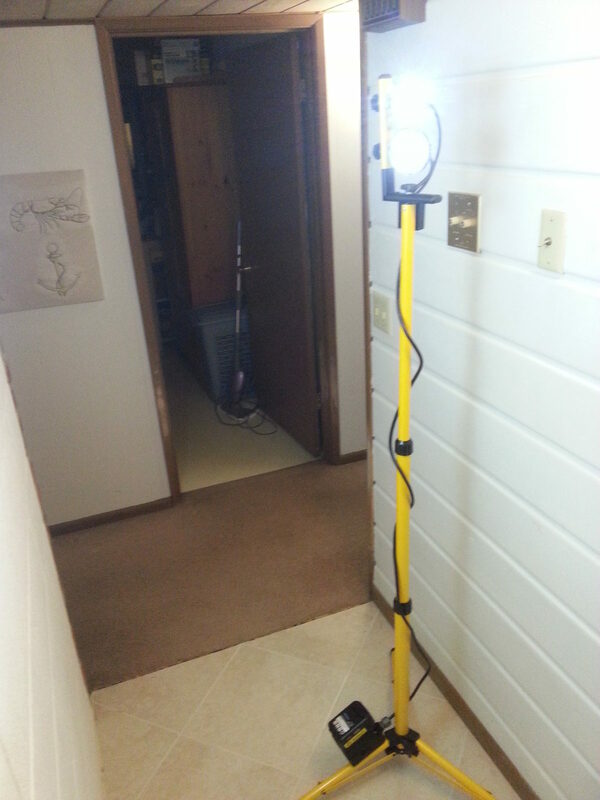 The inverter and clock draw about 4 watts, and there is also a 28-watt LED lamp for extra load. A voltmeter/ammeter tells me that I’m drawing 32 watts with the lamp, inverter, and clock. It remains pretty linear; as battery voltage drops from 20v to 15v, the amperage goes from about 1.5 to 2. I first tested my new, known-good battery packs, and found that I get about 30 minutes of run time for each rated amp-hour on the pack. For example, a 1.5ah battery ran for 44 minutes, a 2.0ah ran for 59 minutes, and a 4.0ah pack ran for 118 minutes. Rather surprisingly consistent! I got the same results with Ryobi, Dewalt, Bosch, and Ridgid packs. That makes sense since they are all using common 18650 lithium cells internally, from reputable lithium cell manufacturers that rate their cell capacities the same way. Ryobi and Ridgid packs have internal protection circuits that cut off when voltage drops to 15v. Dewalt and Bosch lithium-powered tools don’t have protection circuits inside the battery pack; they put it in the tools and chargers. Dewalt “20V Max” batteries provide all cell connections on the pack, so I was able to use an external lithium 5S alarm board that beeped at me when it got down to 15v. Bosch 18v lithium packs don’t have internal protection, and they don’t expose the cell balancing connections to allow a common lithium alarm board either, so I just had to watch the voltmeter for when it dropped to 15v. I think Bosch has a poor design, because the packs cannot be cell balance monitored or charged at all. Interesting result: doing the math, the run times are about 90% of the stated capacity of the battery packs. I believe there are two reasons for that. First, I suspect the watt-hour capacity of the pack as published by the manufacturer is slightly exaggerated. It assumes 18v for the entire capacity (2.0 amp-hour pack says 36 watt-hours), but the working voltage actually ranges from 18v down to 16v during battery depletion. Second, the lithium protection circuit stops the current flow before battery is fully depleted, to avoid damaging the lithium cells. Assuming the discrepancy is mostly due to the cell protection, a 10% safety margin is good. Now it’s time to test the questionable packs and see what I can salvage!